David Gregory "Greg" Kornegay, age 56, passed away surrounded by family on Thursday, April 4, 2019, in the East Carolina Heart Institute at Vidant Medical Center in Greenville, NC. Greg was born on December 1, 1962, in Goldsboro, NC, to A1C Anthony (Tony) Fox of Indianapolis, IN, and Kelly Kornegay Fox of Goldsboro, NC. From his early childhood, Greg loved to fix things, especially things with wheels and motors. He quickly progressed from scooters, to go-carts, to motocross dirt bikes, to four-wheelers, as well as huge diesel trucks. If it once went zoom, Greg could make it go zoom-zoom. Greg’s backyard shop was filled with friends and their damaged machines in need of Greg’s special set of skills. Of course, part of the attraction was the shop’s special adult beverage dispensing machine. Greg was a graduate of Southern Wayne High School, and an employee at Jeffreys Distributing Company, in Goldsboro, NC, where he skillfully maintained the fleet of delivery trucks for over two decades. Greg and his lovely wife Angie Smith Kornegay had two beautiful daughters, Haley (1993), and Hannah (1997). His father Tony, his wife Angie, his “Kaki” Claire Kornegay Parks, and his much-loved Ralph and Janet Kornegay of Mount Olive, preceded Greg in death. 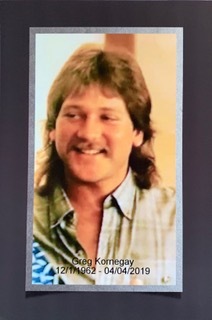 Greg is survived by his two daughters and five grandchildren; his mother, Kelly Gaudette and sisters, Tracy Fox (Wayne) and Amy Rockwell of Connecticut; his brother, Robert Kornegay (Josie) of Swansboro, NC. ; his nieces, Leslie Parks Taylor (Danny) of Bogue, NC, and Kristin Cowan Harvey (Eric) of Clayton, NC. Greg is also fondly remembered by neighbors, family, and friends as a kind-hearted mentor and friend. Greg’s memorial service will be held Thursday at 5 p.m. Please visit the families Facebook page for details.